Does this shirt make me look fat? Fewer things are cuter than looking at your dog wearing a well-fitting t-shirt with a funny or witty saying on it. Actually, figuring out what size shirt your dog wears, though, is a whole other story! Before you round your pooch up to measure him or her, you're going to need to gather some basic supplies. In addition to a calm, willing human helper that preferably is someone your pup knows, you're going to need a length of soft rope, a tape measure, a bowl full of yummy treats that your dog adores, and a sense of humor. If you have a soft tape measure laying around, use that instead of the soft rope and tape measure. Grab a pen and paper and you'll be ready to go! Bring your dog and to the area you're going to be measuring him in. Have your human helper grab a handful of the treats and kneel on the floor at your dog's head height. Their goal is to have your dog standing on all four feet with his head up and his back straight. Allow your helper to use as many treats as necessary to keep your dog still, in position and focused on the food. While your helper is keeping your dog entertained with the yummies, wrap the length of soft rope around the widest part of your dog's ribs, just behind his elbows. Mark the spot the rope overlaps with your fingers. Measure from the end of the rope to the spot marked by your fingers using the tape measure. Alternatively, if you have one available, use the soft tape measure. Write this measurement down as your dog's "girth" measurement. Take a deep breath and have your helper catch your dog's attention again. When your dog is settled and not squirming, lay one end of the soft rope at the base of your dog's neck, where his collar sits, and lay it along your dog's spine until it touches the base of your dog's tail. Mark that spot with your finger and measure the length of the rope with your measuring tape. Write down this measurement as your dog's "back length" measurement. Release your dog and human helper. Find the size chart for the t-shirt you're looking for; they're easily accessible by brand online. Look for your dog's girth measurement. Most t-shirt measurements are given in a range. For example, a size Large might be 24 to 30 inches. 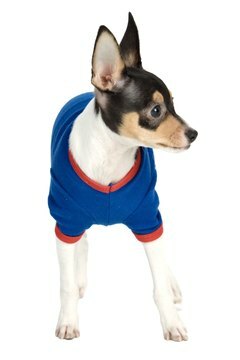 If your dog's measurement falls towards the upper end of a size range, then choose the next size up. 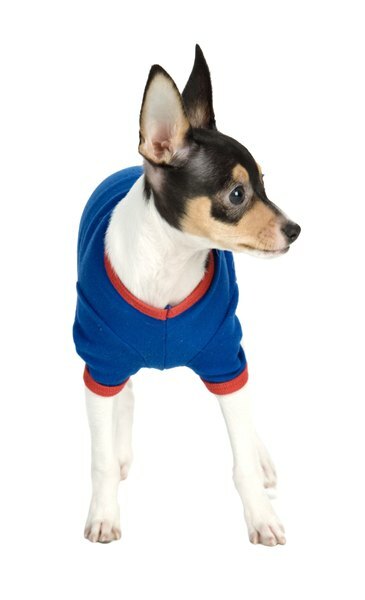 Clothes that are slightly too big are far more comfortable for you and your dog than clothes that are too small. Check the back measurement if you have a long-backed dog, like a dachshund. Otherwise, you're good to go!